The children who attended Somers Camp returned safe and sound and from all accounts, a fantastic time was had by all. Ms Toni Barker who went with the children shared how the Hillsmeade students participated in new learning opportunities, team challenges whilst developing new friendships. Ten days is a long time to be away from home (for the children and the parents), but an adventure that the boys and girls will remember for a very long time. On Monday and Tuesday this week, Mrs Jodie Bray and I attended the C4 Casey Cardinia Network of Schools conference, Building Staff Capacity. Michael Fullan, OC, professor emeritus at the University of Toronto in Canada worked with us to take control over our own situation (ie. Hillsmeade PS) by linking to others locally and in networks. He challenged our thinking on being able to improve our own school but also to be a ‘system player’ by having greater influence in the bigger system (ie. other schools in the DET). He referred to the right drivers for change (capacity building, collaborative work, pedagogy and systemness). As I type this edition for the Link, I observed the Grade 4 team of teachers come back into the school after visiting one of our network’s schools to observe their teaching of VCOP. Our second presenter, Simon Breakspear focused more on the micro- management of pedagogical practice and set out developing practical, evidence- based strategies for mobilising staff and shifting professional practices. 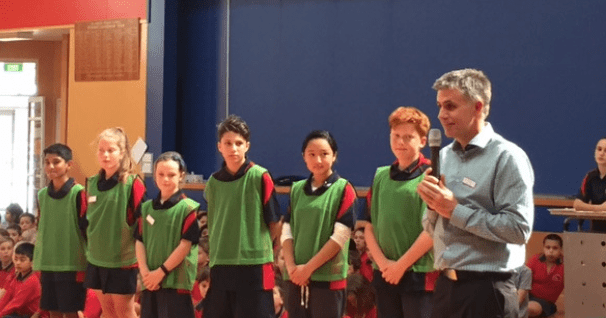 At our last assembly, the grade 6 student leaders modelled the new green vests that are being worn by the recently trained Peer Support Leaders in the yard at lunch time. Mr Scott Clode informed all boys and girls that if they needed some help or support at lunch time they could look for the leaders in these vests who are now trained to guide and work with the younger children. The leaders have reported working with children on peer relationships and friendship interactions. Monday 2nd November is a pupil free day (Curriculum Day) for our teachers to undertake professional learning and commence the discussion around the 2016 curriculum. The new Victorian Curriculum has been announced and although there are not too many major changes, there are new areas that need to be worked through by the teams. We are also hoping to plan our 2016 incursions & excursions so families have a better idea at the beginning of the year as to what is happening and when. I trust you all enjoy the remainder of this week.